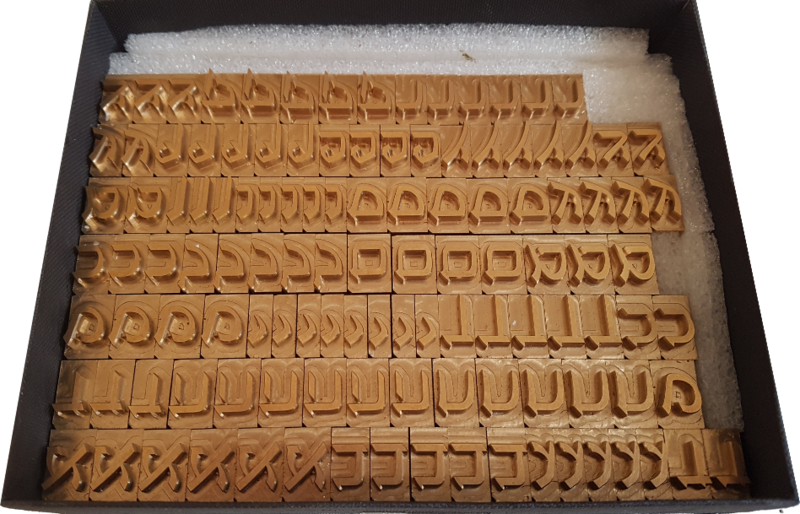 A range of Hebrew fonts are available for brass type manufacture. The standard sets we make for these contain only the basic 27 letter Hebrew alphabet (see composition table below), however other symbols are available. If you require other pieces such as ligatures, geresh etc. then let us know so that we can check if they exist in the particular typeface. Some fonts have ascii numerals and symbols made up in the same style, if required we can supply these as part of a custom composition set. If you have another specific typeface that you want then we cat make it from your TrueType or OpenType font file. Please note that it is not normally feasible to make brass type from a PDF artwork. * The tall ascender on the letter lamed and the long descenders on the finals mean that these fonts need a very large body size. ** Other symbols available, please enquire. These are our standard set compositions for Hebrew type but if you require a different quantity, please contact us to discuss. The grey box represents the actual metal body height h of the brass pieces. h1 is th height of the central section of the character, not including ascenders or descenders. This will typically be the height of the letter kaf measured across the flats of the lines (not including serifs). The h1 measurment is also known as x in font design terminology. A font size can be specified by body size (h) in points or millimetres the same as any other typeface. However most customers prefer to specify h1 and let us work out what body size that will fit onto. Please contact us to discuss sizing requirements and price. All Hebrew font orders are quoted individually due to their specialized size and composition requirements.